Newmarket, NH; August 25, 2016 - Proulx Oil &Propane (Proulx) unveiled its newly-remodeled pink propane delivery truck last weekend at Epping's 275th birthday parade, marking the launch of its annual Pink Truck Campaign. This partnership with the American Cancer Society (ACS) Making Strides Against Breast Cancer initiative increases awareness about breast cancer as the truck visits neighborhoods throughout New Hampshire and Maine. When customers receive a propane delivery from the pink truck, Proulx will donate a portion of each sale to the ACS. "We associate our pink truck with strength and support for people who have been affected by breast cancer," said Jim Proulx, Proulx Oil and Propane's president and CEO. "This cause is one that's very important to us, and we know that on the road to recovery, you can never have too many people in your corner." Customers can request their heating fuel deliveries be made with the made-over pink truck - it is fresh from the shop with a new coat of bubblegum-pink paint, shinier chrome and custom decals showing the partnership between Proulx and ACS. In addition to visiting neighborhoods across New Hampshire and Maine, the pink truck will make appearances at both the Exeter and Dover Making Strides Against Breast Cancer walks in October, which is Breast Cancer Awareness month. To support ACS and request a pink truck delivery, contact the Proulx customer service team at 800-287-1921. Since 1944, Proulx Oil & Propane has provided residential and commercial customers with propane and oil heating fuel delivery and service. With more than 45 employees and the most modern delivery fleet of any company in the area, Proulx Oil & Propane is committed to growing our business and supporting our community through an expanding base of satisfied customers and partnerships. Proulx Oil & Propane is based in Newmarket, New Hampshire and services locations in New Hampshire, Maine and Massachusetts alongside its sister companies, Reliable Oil & Propane and Bourque Oil & Propane. 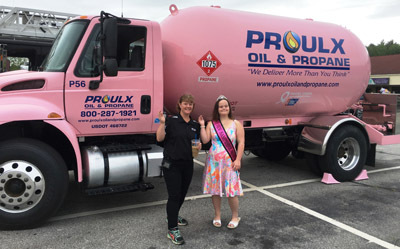 Dawn Lane, a driver with Proulx Oil & Propane, drove the company's newly-painted Pink Truck in Epping's 275th birthday parade this month, marking the launch of the annual Pink Truck Campaign. A portion of proceeds from deliveries made by the Pink Truck will be donated to the American Cancer Society at the close of the annual fundraiser and awareness effort.